C|M|LAW’s Fair Housing Clinic successfully appealed a foreclosure case in the Ohio Eighth District Court of Appeals. The Eighth District found that the trial court abused its discretion when it denied the Clinic’s reasonable Civ.R. 56(F) motion for discovery time and proceeded to grant summary judgment in favor of the plaintiff bank. The decision remands the case back to the trial court for discovery on fair housing and other consumer protection law claims in this foreclosure case against an African-American and American Indian family. Beal Bank S.S.B. v. Means, Cuyahoga App. No. 96252, 2011-Ohio-5922. Jeff Albiez worked on the trial court filings and Neil P. McGowan worked on the appellate brief when they were students in the Fair Housing Clinic. “Congress enacted Section 8 of the Real Estate Settlement Procedures Act of 1974 (“RESPA”), 12 U.S.C. § 2607, to protect homebuyers from the conflicts of interest that arise when a real estate professional accepts kickbacks for referrals—conflicts that tend to increase the cost and decrease the quality of settlement services. Congress prohibited the payment or receipt of kickbacks, id. § 2607(a), and authorized consumers to recover three times the settlement charge if they receive services in violation of that prohibition, id. § 2607(d)(2). Whether Section 8 of RESPA is a permissible exercise of Congress’s authority to enact “statutes creating legal rights, the invasion of which creates standing.” Lujan v. Defenders of Wildlife, 504 U.S. 555, 578 (1992) (quotation marks omitted). See our prior post on the case. Adjunct Professor Ed Kramer, who teaches the Fair Housing Law Clinic conducted a workshop presented by the Medina Department of Planning Services on the topic of Fair Housing Acts, Group Homes and Zoning in Ohio. Professor Kramer’s materials can be accessed here. Part of the research was taken from a student memorandum done by Jessica Paine for the Fair Housing Law Clinic entitled, “Ohio Case Law on Conflicts Between Group Homes and Exclusionary Zoning”. The materials include information on organizations which will help individuals with housing discrimination issues, and a list of selected fair housing cases on land use regulations, with brief case summaries. Marilyn Tobocman, Adjunct Professor for the Fair Housing Law Clinic, Marshall alumnus and Assistant Ohio Attorney General has just been named to serve as a Co-Chair of the Federal Bar Association‘s new Civil Rights Section Discrimination in Employment, Housing and/or Public Accommodations Committee. 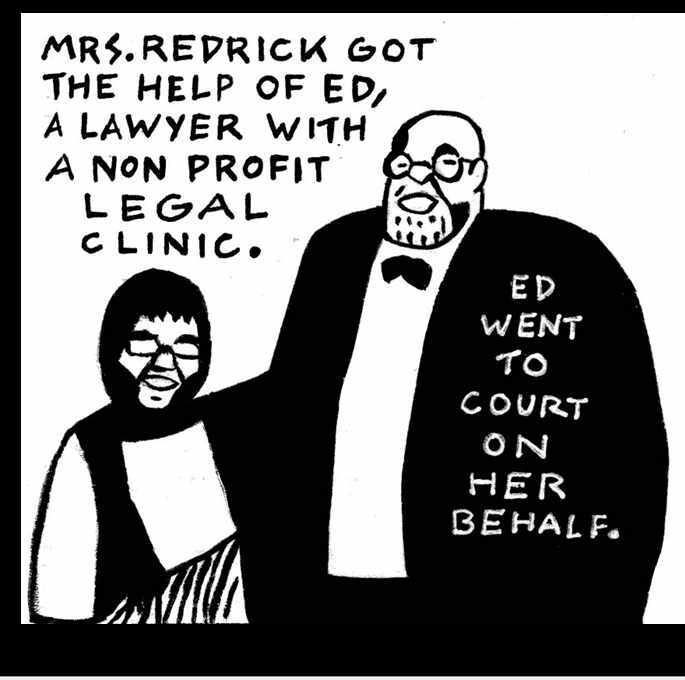 Prof. Ed Kramer – Comic Book Superhero! Even though the Avengers have finished filming in Cleveland, we still have at least one comic book superhero in town. 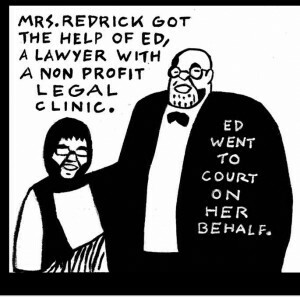 Adjunct professor Ed Kramer of Housing Advocates, Inc., who teaches C|M|LAW’s Fair Housing Clinic appears in the graphic novel Understanding the Crash by Seth Tobocman, Eric Laursen and Jessica Wehrle. Chapter 2, “She Lives Here” tells the story of a woman swindled by a loan shark, and Professor Kramer’s court battle to save her house from foreclosure. This fairly short book is full of insights into how the foreclosure mess came about, the intricate financial shenanigans involved, present solutions and the response of community organizations such as East Cleveland’s Organizing Project, The Housing Advocates, Inc and Miami’s Take Back the Land. The library has a copy of Understanding the Crash.